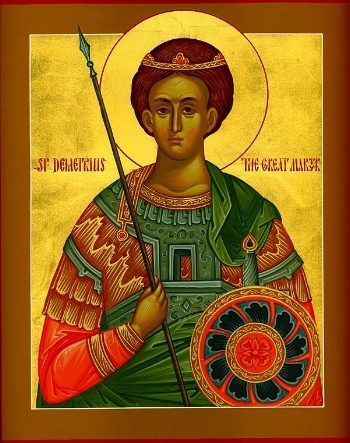 Saint Demetrius suffered in Thessaloniki, Greece during the reign of Galerius Maximian (c. 306). He belonged to one of the most distinguished families of the province of Macedonia and was widely admired not only because of his noble ancestry and grace of bearing but also for virtue, wisdom, and goodness of heart surpassing that of his elders. The military expertise of Saint Demetrios led Galerius, as Caesar of the Eastern Empire, to appoint him commander of the Roman forces in Thessaly and Proconsul for Hellas (Greece). But for all this, Demetrios remained ever aware of the underlying realities of life. Since faith in Christ had touched his heart, all the glory of this world meant nothing to him, and there was nothing he preferred to teaching and preaching the word of God. The pagan Emperor Maximian had just won a series of brilliant victories over the Scythians and was on his way back to Rome when he halted at Thessaloniki to receive the acclamations of the populace and to offer sacrifices in thanksgiving to the pagan idols. A number of pagans, envious of the success of the Saint, took advantage of the Emperor's presence in the city to denounce Demetrios as a Christian. Maximian's astonishment gave way to violent indignation when he gathered that Demetrios' fellowship with the Disciples of Christ extended to making use of his official position to spread the faith. Demetrios was summoned and confined in an insalubrious cell, located in the basement of nearby baths. When Demetrios entered the cell a scorpion approached his foot, poised to give a fatal sting. The Saint simply made the sign of the Cross and it vanished. Then he was left alone in the humid, foul-smelling atmosphere, but he took no account of it since he was full of joy at the thought of soon sharing completely in the Life-giving Passion of the Lord. He was only sorry at having to wait for the end of the celebration of the Emperor's triumph before he could fulfill his martyrdom. As was usual on those occasions, Maximian arranged for games and gladiatorial combats to take place in the amphitheater of the city. He had brought with him a man of gigantic stature and Herculean strength and skill in single combat that no one could withstand him. There was in the city a young Christian called Nestor, who observing the empty pride of the Emperor in the victories of his champion, made up his mind to show him that real power belongs to Christ alone. He ran to the baths where Demetrios was imprisoned and asked for the protection of his prayer in going to confront the giant. The Martyr made the sign of the Cross on the brow and heart of the boy and sent him like David before Goliath. He reached the amphitheater just as the heralds were crying out on all sides for any who would stand against Lyaios. Advancing towards the Emperor, Nestor threw his tunic to the ground and shouted, 'God of Demetrios, help me!' In the first encounter, at the very moment the giant rushed upon him, Nestor slipped aside and stabbed him to the heart with his dagger. There were uproar and amazement at the marvel, and people asked themselves how a mere child, relying neither on strength nor weapons, could so suddenly have brought down the hitherto invincible barbarian. The fact is that Nestor placed his entire hope in the Lord, 'the Master of the contest'. He who delivers their enemies into the hands of the faithful. Rather than yield to this sign of the sovereign power of God, the Emperor flew into a rage and ordered the immediate arrest of Nestor and his beheading outside the city. He had heard Nestor calling upon the God of Demetrios and, supposing the Saint had used some kind of witchcraft. Maximian ordered his soldiers to go and thrust Demetrios through with their lances, without trial, in the depths of his prison cell. There were some Christians, including Saint Demetrios' servant Lupus, present at his martyrdom, and when the soldiers had gone, they reverently buried the Saint's holy body. Lupus kept the blood-stained tunic of the holy Martyr and, taking the royal ring from his finger, placed it on his own. By means of these two trophies, Lupus wrought many miracles and healings; but when Maximian got to hear of them, he immediately sent soldiers to behead the faithful servant. It was God's will that the grace with which He filled Saint Demetrios should remain active even after his death. This is why He caused to flow from his body a myron with a delightful scent, which had the property of healing all who took it as an unction (efchelaion), with faith in the intercession of the Saint. Time and again, for sixteen hundred years, Saint Demetrios has given proof of his benevolent care for the city of Thessaloniki and its inhabitants. He had defended them from the attacks of barbarians, fighting for them on the ramparts; he has preserved them from plague and famine, healed the sick and comforted the afflicted. So many are his miracles that attempting to number them all would be as senseless as trying to count the grains of sand on the sea's shore. Great Vespers followed by the service of Artoklasia (Blessing and Breaking of the Five Loaves) this evening at 7:00 p.m. at Saint Andrew. Orthros (Matins) at 9:00 a.m.
Father Demetrios Harper will be conducting the divine services. May Our Lord and Savior Jesus Christ through the holy intercessions of Saint Demetrios bless and protect him and his beloved family. Chronia Polla!